Georgia Native Plant Guide is the first native plant guide that focuses on Georgia. It is not simply a guide to plants that can be found in Georgia, but those native to Georgia. Each species native to the Peach State is listed by its scientific name and given a brief description of its appearance and attributes. For the environmentalist, Georgia Native Plant Guide also provides a county-by-county list of endangered species. The guide is extensive with some chapters by noted botanists. Samuels educates the reader on what is taking over the land, which plants are headed toward extinction, and which plants are rarely found. Samuels demonstrates that if native gardens were on the rise, more plants would move off the endangered list. 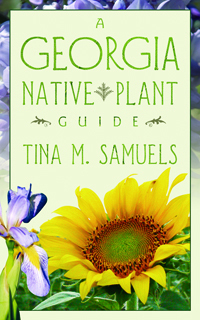 A wonderful beginner’s guide to anyone wanting a true native garden in Georgia, this book provides illustrations, overviews, and lists to help you grow it with ease. A beautiful and helpful book, it is for anyone interested in the environment, Georgia, or the natural world around us.